This 1970s Bulgarian-made Kremona Kazanlik is quite obviously not the finest acoustic guitar ever made. You might even call it crude, as were many Eastern European guitars from this era. But such instruments are not without their charms, even if they are essentially a box with strings on it. 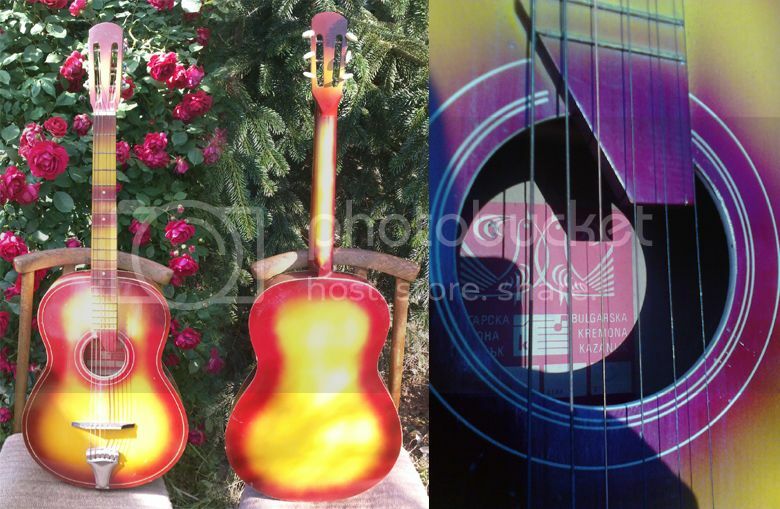 This particular example features a bright yellow/red burst that has been applied to the whole guitar even the fingerboard (possibly in an effort to hide the identity of the cheap and nasty timber beneath). 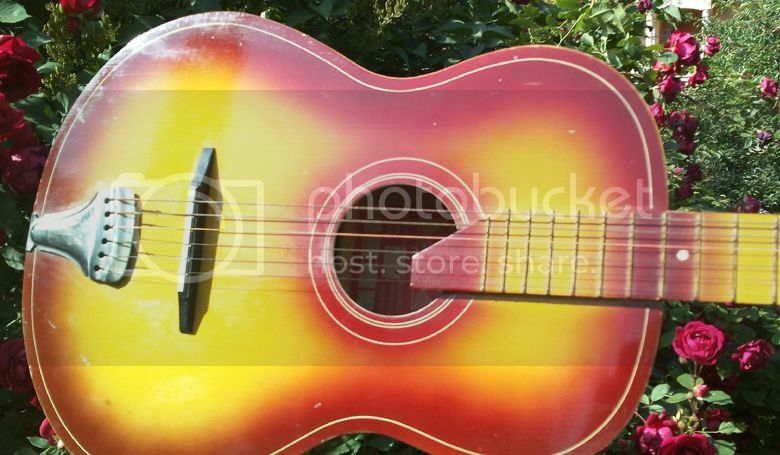 The seller comments that the guitar has been used on a wall as decoration. Unfortunately this might be all the guitar is good for. Currently listed on eBay with a Buy It Now price of $49 (item located in Budapest, Hungary). Why do you loose your time to present such crap? We most own such an unplayable guitar that we keep because it was a present from some one of our family when we were kids and,probably, our first contact with an instrument... Nostalgia can be good for inspiration but NOW is the best part of life! I thought it was visually striking. It's all part of the bigger picture in the guitar world! Visually striking...like an italian icecream! I hope there will always be a place here for guitars that look cool. Well, yes, and also in certain parts of the world under certain political climates, it was the choice of a cheap crap guitar like this or no guitar at all. Personally, I find instruments like this quite fascinating. This guitar is very beautiful! This guitar really is beautiful...but it kinda feels like I'm on drugs when I look at it! Haha! It's a shame more guitars aren't decorated this way!